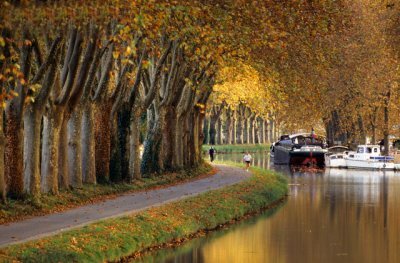 The Canal du Midi is a 150 mile long canal in Southern France. The canal runs from the city of Toulouse down to the Mediterranean port of Sète. It was inscribed as a UNESCO World Heritage Site in 1996. The Canal du Midi was built a shortcut between the Atlantic and the Mediterranean, avoiding the long sea voyage around hostile Spain, pirates and a trip that in the 17th century took a full month to complete. It was opened officially as the Canal Royal de Languedoc on May 15, 1681. The Canal has 91 locks which serve to ascend and descend a total of 190 metres (620 ft). There is much to admire while staying in your self catering holiday rental home in the Canal du Midi - It has 328 structures, including bridges, dams and a tunnel. There are now over 40 aqueducts, the design of the Canal included the first canal passage ever built through a tunnel (the Malpas Tunnel) which you can see whilst on your holiday in the Canal du Midi. The Canal du Midi passes through a 173-metre (568 ft) tunnel through a hill at Enserune. Even today, it is seen as a marvelous engineering accomplishment and is the oldest and most popular pleasure waterway in Europe. Now the Canal is a major tourist attraction and place for leisure activities with many people rowing, canoeing and fishing – a must to do when renting your Canal du Midi holiday house or cottage. Much of it is shaded by rows of huge plane trees and its tow path is ideal for cycling. The canal meanders through the land of the “Cathars”, passing on the way locks, bridges and aqueducts of the period. In the Languedoc-Roussillon, the Canal passes through the Aude department and the Hérault department. 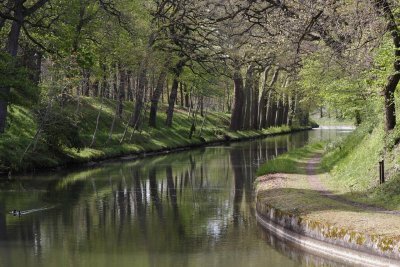 Places on the Canal worth visiting while renting your Canal du Midi holiday home or villa include Fonseranes, Naurouze, Carcassonne, Homps, the Oppidum de Enserune, Ventenac en Minervois, Béziers and Sète. You can take day trips in boats and barges, or cycle along the towpath. Close to the Mediterranean, the Canal du Midi enjoys temperatures of almost 40C during the summer season, between June and September. Winters are mild, but during the months of December to February temperatures in the evenings can drop as low as 2C. Toulouse is the major city which serves the Canal du Midi. Toulouse-Blagnac International Airport is located just 9 km northwest of the Toulouse city centre. Many international airlines operate regular flights to Toulouse from across the UK all year round. Toulouse has good rail networks connecting it to major cities of France, which in turn connect it to international destinations in Europe. High-speed TGV trains connect Toulouse to London and Paris. By road Toulouse is central to several auto-routes.